India PM Manmohan Singh says the country will invest heavily in development projects in Africa to bolster economies ties. He was speaking in the Indian capital, Delhi, at the first summit aimed at strengthening trade and diplomatic ties between India and Africa. India would provide more than $500m for projects in Africa, Mr Singh said. Correspondents say India is increasingly interested in Africa, as it looks for new sources of energy. Mr Singh also said India would give easier access for exports from the world's poorest countries, many of which are in Africa. "No one understands better than India and Africa the imperative need for global institutions to reflect current realities and to build a more equitable global economy and polity," Mr Singh said. The two-day summit is being attended by 14 African leaders. They include Thabo Mbeki of South Africa, Yoweri Museveni of Uganda and Ethiopia's Meles Zenawi. 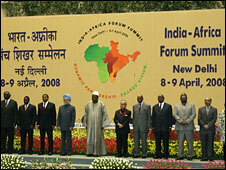 President Mbeki told the summit that India and Africa had many challenges in common. "Our enemy is common. We both have poverty and underdevelopment," he said. The BBC's Sanjoy Majumder in Delhi says India will pitch to gain access to Africa's natural resources - particularly energy- in return for increased aid and low-cost solutions to battle poverty. India has traded with Africa for centuries. It has strongly supported independence movements in several African nations and Mahatma Gandhi's famous civil disobedience movement against British colonial rule began in South Africa. Now it wants to cash in on the goodwill. Although trade between India and Africa has increased to $30bn a year, it is still almost half that of China's. 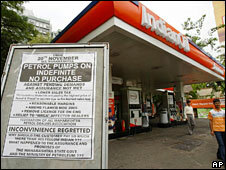 Recently, Delhi has lost a number of lucrative oil exploration contracts in Africa to Beijing. The BBC's world affairs correspondent Nick Childs says in holding the summit India appears to be following China - two years ago, Beijing hosted a ground-breaking Africa summit, a signal of its growing interest in the continent. So over the next couple of days India is expected to announce a massive aid package as well as a number of projects in areas such as information and technology, agriculture and education. Many here believe that India holds an edge because of its expertise in providing low-cost technology - it is already a major supplier of cheap generic drugs. In return it wants oil and gas, minerals and diamonds and also a market for its own manufactured goods. A new report by the London-based think-tank Chatham House says that India is worried about China's encroachment on the African rim of the Indian ocean, which Delhi has long seen as its strategic backyard. So the Indians, according to the report, are responding with deepening security as well as commercial ties with countries like the Seychelles, Mauritius, and Mozambique.